Mallard Creek High will host information meetings about the Charlotte Mecklenburg Schools budget and curriculum options. If you can’t make the meeting there, you can attend sessions at other schools on different dates. 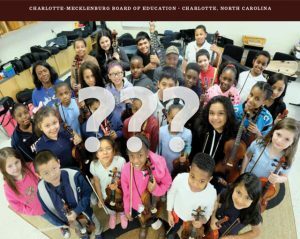 Charlotte-Mecklenburg Schools is holding community-engagement meetings to discuss development of the 2019-2020 operating budget. Employees, parents and community members are invited to attend, learn more about the current budget climate and give input on budget priorities to support academic success for all students. April 3, 6:30-8:30 p.m., Mallard Creek High, 3825 Johnston Oehler Road, Charlotte. April 11, 6:30-8:30 p.m., Crown Point Elementary, 3335 Sam Newell Road, Matthews. Charlotte-Mecklenburg Schools will adopt a guaranteed viable curriculum for the 2019-2020 school year. Parents, employees and community members are invited to attend sessions to help choose tools and resources for English language arts for grades K-8, math for grades 6-8 and NC Math 1, 2 and 3. April 8, Independence High, 1967 Patriot Drive, 6-8 p.m.
April 9, South Mecklenburg High, 8900 Park Road, 6-8 p.m.
April 10, West Charlotte High, 2219 Senior Drive, 6-8 p.m.
April 11, Mallard Creek High, 3825 Johnston Oehler Road, 6-8 p.m.April 12, Spaugh Administrative Center, 1901 Herbert Spaugh Lane, 10 a.m. to 2 p.m.